A bit “angry” and “confused” with all the rumours, and speculation? The back and forth comments from agents and club representatives hasn’t helped but TKTG will try to make sense of all the madness. We bring together some of the best articles from around the web on the Wayne Rooney saga and what this could mean for him and Manchester United. The Wayne Rooney saga rumbles on. Everybody seemingly has an opinion, and the vast majority seem to have little sympathy for the Manchester United striker. Or at least they have as much sympathy as you’re bound to have for a guy who will earn $36 million in wages over the next two seasons. One thing we probably shouldn’t be doing is attaching value judgments as to who is ethically “right” and “wrong,” or whether Rooney’s complaints are “justified” or not. The fact of the matter is that this isn’t about some kind of “moral judgment.” It’s about Rooney doing what is best for Rooney, not just financially, but in terms of his playing career, while United does the same for themselves (and their owners). It’s not about selfishness or lack of loyalty; it’s about “rational self-interest.” It’s the way the world goes, most of the time. And it has the great merit of making it easier to understand where you stand vis-a-vis the folks you’re negotiating with. ESPNFC – Rooney: Will Chelsea and United Do Business? After several weeks of posturing, some carefully crafted wooing and media leaks aplenty, Chelsea manager Jose Mourinho has played his hand in an attempt to sign Wayne Rooney from Manchester United. While Mourinho did not want to publicly announce his desire to sign Rooney when those of us in the written press were ushered into a behind-closed-doors briefing following his media unveiling as returning Chelsea boss on June 10, it seemed clear the striker was the jewel he had set his heart on. Yes, there were flirtations with Napoli’s Edinson Cavani, and there continue to be rumours that Zenit St Petersburg forward Hulk was on his radar – but Rooney’s suggested availability meant that, if the Chelsea hierarchy wanted to give Mourinho a welcome-home gift, it would be a 27-year-old forward who no longer appears to be wanted at Old Trafford. With earlier reports suggesting Juan Mata or David Luiz were being offered as bait for United in a potential deal having been firmly denied by Chelsea, we are about to discover whether the eagerness of the Premier League champions to offload their No. 10 is strong enough to encourage them to do business with one of their main rivals. Any such move would represent a huge gamble for United. If a revived, re-energised and chastened Rooney was to explode back into life and inspire Chelsea to the Premier League title next season, the haste of his former employers to sell him to a domestic challenger would be exposed as a major mistake. On the other hand, if – as many have hinted – United officials believe Rooney’s best days are behind him and the moment is right to cash in on a man who will only be a second-choice striker in the coming season, a bold and brave move to sell him to Chelsea could be imminent. David Moyes’ reign at Old Trafford had barely officially begun when he voiced his belief that a man who had swapped Merseyside for Manchester could make history. Not him, however. Instead, Wayne Rooney, the previous defector from Goodison Park, had the opportunity to break records. Now that looks distinctly unlikely. But the bare facts are that Rooney has 197 goals for Manchester United. Law ended up with 237, Charlton 249. Given two injury-free seasons as a first choice – not the guarantee it once was – Rooney could stand alone. Should he spend the rest of his career at Old Trafford – which, again, seemed a safer bet in the past than it does now – his current total of 400 matches would be swelled considerably. The rather exclusive 700 club comprises of Charlton, Ryan Giggs and Paul Scholes. 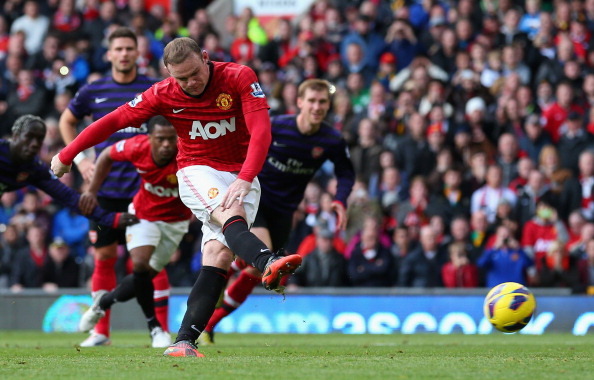 Should he choose to – and it now seems he won’t – Rooney could become its next member. Games and goals can give a statistical case for greatness. Yet it also provokes questions about Rooney’s place in the pantheon of United’s finest footballers. Team-mates invariably described a colleague as “a great player”. For it to be a credible assessment, however, exacting standards have to be applied. And in United’s glorious past, 11 players have a cast-iron case to be called greats: Charlton, Law, Giggs and Scholes plus Duncan Edwards, George Best, Bryan Robson, Eric Cantona, Peter Schmeichel, Roy Keane and Cristiano Ronaldo. There is a temptation to round it up to a dozen by including Ole Gunnar Solskjaer, not least because he was United’s perfect 12th man, just as there are grounds to augment the magnificent 11 with others, from Billy Meredith a century ago to Nemanja Vidic now.